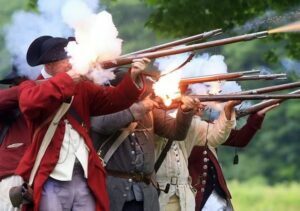 A Revolutionary War Reenactment weekend at the Rebecca Nurse Homestead! The time is sometime in the summer of 1774 to early 1775. The Port of Boston has been closed in retribution for the Boston Tea Party. The countryside is rising up and the courts in Worcester County have been closed. stockings, tents, knapsacks, and cartridge pouches. Meanwhile, alarmed by the rising of the “country people” General Gage is gathering intelligence from local loyal subjects, and sending patrols of Regulars into the countryside for “exercise”, and to try to locate and seize military stores. Cannon and powder were taken from Charlestown and Cambridge, and there was a patrol that was turned back by local militia at Salem, and there are rumors of a raid not far from John Adams; home in Braintree – could Danvers be next? PLEASE NOTE: The regular guided tours of the Nurse Homestead will not be available this weekend, instead we will have reenactors in the house interpreting colonial life. This entry was posted in Events, News, Visitor Info. Bookmark the permalink.